It may be unusual, but I like to decide what vegetables to grow in the same way I pick stocks to invest in. Gardeners are investors. We invest our time—lots of time—money, energy and effort into our garden. If we plan well and tend it daily, our garden pays big dividends. I’m an investor and volunteer investment coach for one of the popular investment workshops. And I’m an avid gardener. Investors are always looking to value as the key component in building their portfolio. No matter if the particular offering is a stock, a bond, a piece of real estate, a business, a commodity, or a flourishing garden. Investors like Charlie Munger and his long time partner, Warren Buffet, are known to be very particular about the value of a company and how it suits their criteria of what makes that company “wonderful”. So why not approach the garden “portfolio” with the same value-centered scrutiny? As we thumb or click through the various prospects featured in our newly arrived garden catalogues and articles, we need to keep practical principles in mind. If we apply ourselves more rationally to the selection of what vegetable to plant, our garden is more likely to flourish. Like Munger and Buffet do with their investments, we’ll reap more rewards throughout the growing season, with a little bit of careful planning up front. Borrowing heavily from Charlie Munger’s BBC Interview (6 minutes in), here’s how we can begin to load in our portfolio with quality selections. Am I capable of understanding this crop? If it’s an unfamiliar crop or variety, can I get to know its particular attributes and requirements? Do I really like to eat the plant’s produce? Am I swayed by the promotional hype (e.g. new, bigger, better, exotic)? What is this vegetable’s intrinsic value? What will this crop require of me, the gardener, in terms of management capabilities, knowledge, and time? 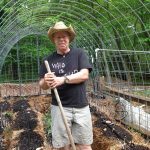 Will its cultivation fit my style of gardening (part-time, full-time, raised bed, permaculture, organic, chem-free, etc)? How much time, energy, effort, and garden space am I willing to risk? As an “investor” would I expend a sizeable part of my bankroll on this food stock? Is it a good fit for my area’s growing conditions? This last question of growing conditions ties into your area’s climate and, very importantly, your garden patch’s specific microclimates. We have both a hillside garden and a lowland garden. Even though our “upper garden” is miles to the north and 500 feet higher in elevation, guess which garden gets the most frosts? Oddly, it’s our lower garden. Like many of you, we like to try out new varieties and new techniques. Sometimes, we forget to size our experiments appropriately. Here are a few illustrations of how the “experiment in small quantities” concept should have been applied. Squash and pumpkins hog space and attention. We had high hopes of growing a bunch of squash and pumpkins of various types. Reviewing some of our 2018 newsletter issues, it’s easy to see how much attention we poured into coaxing our crops through the ravages of squash vine borers, squash bugs, and powdery mildew. Squash and pumpkins need lots of sun. In the end, we obtained a relatively few number of squash and pumpkins. Also, we ignored an obvious shortfall of direct sunlight combined with a restricted growing space and tried to override the conditions of our garden setting by planting in larger quantities. This is how the “Las Vegas” bets are placed. We’re not gamblers, and while we’re all for trying small experimental plantings, it should be no more than 20% of our garden space. “Your first loss is your best loss”. When we see our investment dropping and have an opportunity to cut short the losses, we often hesitate to do so. After all, it might go back up, right? It might. Think of the gambler losing at the roulette wheel putting it all on red “just one more time”. The same goes with a garden planting that is obviously not living up to its promotional glory. Just a little tweak, or given time, or maybe a dose of compost tea, or whatever cure…we tend to hang on. And yes, there are exceptional recoveries, but all too often it might be best to pull the plant(s) and put in something that you expect will do better. We actually did this with a few items like the carrots that were not faring well. They got replaced with sweet potatoes that took off and yielded well in the “carrot box”. We did the same with wimpy tomato plants and worm-infested kale. You only have so much space, and so much time-especially if gardening in the colder zones. As our glossy garden catalogues arrive in material or cyber fashion, there’s always a bunch of new things to try out. Descriptions like AMAZING, GIGANTIC, SWEETEST, LEGENDARY, WORLD’S FIRST adorn the airbrushed photoshopped illustrations. And that’s just the tomatoes! Though we’ve offered our take on how best to stay rational and pick your order with care, it’s not to say you shouldn’t expend a measure of what investors call “Las Vegas” capital. Just a little mad money to play with. A roll of the dice, a pull of the handle, a little fun. And, who knows? That heirloom black and green striped tomato may turn out to be a champ! The deal is–if you lose, you don’t lose much. That’s nearly a direct quote from another well-known value investor, Monish Pabrai. Growing new things keeps gardening fun and fresh. A combination garden design using raised beds and rows. Circling back to the major criteria in picking a crop, one vital overarching aspect of a rational selection is having a plan. Map out your garden plan. It can be mapped out on the back of a piece of cardboard, scaled on a piece of graph paper, or colorfully displayed on a software program like our favorite “Garden Planner“. Whether it’s a garden plan, or a goals journal and planner for your personal and professional goals, having a defined garden plan will keep you on track. You are the architect, the builder, and the end consumer. Ultimately, you are the investor who’s due diligence will make it all happen. The better you know yourself, your capabilities, the garden conditions, and each crop’s requirements, the better your garden will be. From Our 2018 Garden Planner (Partial View) Allows us to note the performance of each crop and compile historical data. Being a visual learner, I drew up a Venn diagram that helps clarify many of the variables that affect how a garden grows. It’s by no means a complete picture or listing of all the parameters, yet it helps us glean many of the variables that influence how our garden turns out. This “inner circle” of optimum plants will comprise around three fourths of our garden space and time. Your winners are those that intersect each of these three areas. Chances are, many of the mediocre performers are in the double layer zones where two out of three circles overlap and these will be limited in space and number. Whatever newbies come along will be tested along the margins. It’s the same thing I do with investments. We have no idea whether Charlie Munger or his pal Warren Buffet are garden aficionados. But if all they had to work with was a patch of ground and a seed catalogue, dollars to pumpkin seeds, they’d stick with the wonderful winners. If they were gardeners, dollars-to-pumpkins, Munger and Buffet would grow garden winners. We’re eager to hear from you, our readers and fellow gardeners, about how you manage to select your vegetables for the coming seasons. You can send us a message or comment on our Facebook page. Meanwhile, here’s wishing everyone a fantastic New (garden) Year! May your gardens grow in beauty and bounty!